Here we can see the chateau from 1611, rebuilt in the Baroque style, with the Classicist gate and out-offices and farm buildings that come from the 18th century. A possibility of swimming in the indoor swimming pool. The first reference to the village comes from 1318. The granary, dating back to 1691, was built on the foundations of the original fortress from the year 1405. The Church of St Michael from the 14th century. The village, first mentioned in 1378, has a small chapel and ruins of the former fortress, later converted into a granary. The village was first referenced as the property of the Order of Hospitallers in 1138. Visitors are invited to see the remains of the fortress from the year 1390, the Church of St Procopius from the years 1778-1781, built in the late Baroque style, and the Baroque refectory. There is a natural swimming pool in the village. The first reference of the village dates back to 1392. There is the Baroque Chapel of the Sacrifice of the Virgin Mary from 1743 and the statue of St Wenceslas coming from the latter half of the 18th century. 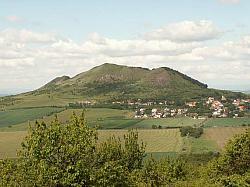 The prominent basalt hill (457 m above sea level), a part of the site protected since 1951, today a national nature reserve. The site is also known for its tradition in sports flying, today mainly hang-gliding and paragliding.